Laid out on the coast, a mere 15-minute drive to the north of Agadir, the fairways of the Tazegzout course at the Taghazout Bay Resort occupy a massive 190-acre site that sits 250 feet above the Atlantic, with views of the ocean’s sparkling waters enjoyed from every hole on the layout. Opened in 2014, the course anchors yet another enormous government-backed residential project that’s still under construction but a new 150-bedroom Hyatt hotel is built and operating next to the clubhouse, offering visitors top class accommodation for spa and golf breaks. Designed by Kyle Phillips, who has previously worked in Morocco on projects at Al Maaden and Akenza in Marrakech, the course is routed in two returning nines, with holes winding their way around rugged areas of bare limestone and through clusters of argan trees which were preserved during the build. Tazegzout # 6 in Morocco and built in 2014. The course is set on the Atlantic Ocean in a spectacular setting behind the famous hill in Agadir 80 mrs above sea level. Wide fairways with a lot of runoff from the hilly terrain. It has gullies which come into play on several holes so a keen eye is needed on many holes or one will find a watery grave. 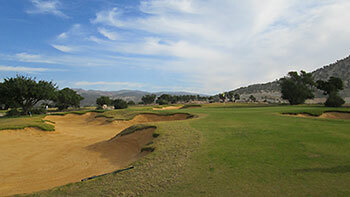 As the course is new it was a bit barren looking the poor turf/sand required an adjusted chip/shot. A lot of barbers poles and blind tee shots making it a bit difficult to know where you are going - one of our golfers played to the wrong green early on. The player has a chance to warm up on the front and needs to be on his game for the finish which is challenging and spectacular. The greens were large with hidden breaks towards the sea. Some greens a bit too severe being unreadable. Recommendation: We played it in February 2016 and would say if you want views yes- ranking number 6 not yet, maybe after some years. 4/10. Confusingly entitled “Tazegzout,” because Taghazout Bay is the name of the massive resort that it’s located in, the course lies to the north of Agadir on the Atlantic coast and it’s one I’ve had an eye on for a while. I played the Kyle Phillips-designed Al Maaden course in Marrakech four years ago and was, quite frankly, more than a little disappointed with it - though, in fairness to the architect, his work was absolutely compromised on that project by having to arrange holes around an enormous “Moroccan water garden” in the middle of the property. This time, the layout sits atop a hill overlooking the coast, with ocean views from every hole, so such a spectacular location certainly allows room for more creativity. Like the new Mazagan course at El Jadida, paspalum grass is used here on tees and fairways but greens are sown with bent grass, which I think offers a better putting surface. Holes 1-9 are really just a warm up for the dramatic inward half, though that’s not to dismiss the front nine out of hand as it contains some really terrific holes, a few of them fronted by sneaky little drainage channels. The downhill par four 4th is particularly memorable, its fairway sloping right to left into a deep gully that runs along that side of the hole, with the green protected on the left by a beautifully constructed, ragged-edged bunker. The par five 9th is another standout hole, played to a plateau green. Again, if you’re left on this severely doglegged hole then you’re dead in another gully. I wasn’t prepared for the way these ravines at holes 4 and 9 are brought into play on the back nine, where they have to be crossed four times, at holes 10, 14, 16 and 17. Indeed, as the round progresses, the gullies get deeper and wider (becoming more of a gorge or a canyon to be crossed on the last two of these four holes) as the round reaches a real climax, thanks to a very clever routing on the way home. Heroic, do or die, shots to the green are called for on both the par four 16th and par three 17th and if your pulse isn’t racing by the time you stand on the 18th tee (assuming you’ve past the test on both the preceding holes) then your heart must be made of the same limestone that the course is built on because you will just have played as thrilling a pair of back-to-back holes that I’ve ever come across in a very long time. The par five 18th allows you to catch your breath a bit before the round ends but you might be a little shaken, if not stirred, as you sit down in the clubhouse to reflect on the game you've just had, especially over those sensational closing holes.